“Agriculture is one of the most creative acts that human beings be involved in. Small farmers are the real source of real food. Commodities are ruining the farmers, they are ruining the land and the environment. The chemical industry and GMO are killing real agriculture. They are instruments of war. 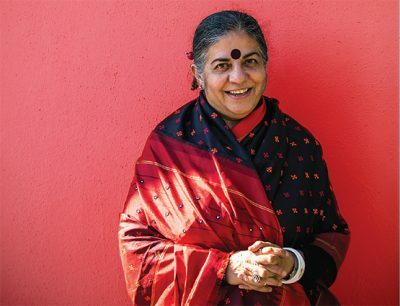 Prof. Vandana Shiva is a physicist, ecofeminist, philosopher, activist, and author of more than 20 books and 500 papers. She is the founder of the Research Foundation for Science, Technology and Ecology, and has campaigned for biodiversity, conservation and farmers’ rights, winning the Right Livelihood Award [Alternative Nobel Prize] in 1993. She is executive director of the Navdanya Trust. Vandana Shiva opens the We Feed the World exhibition in London, 11 October 2018. The Gaia Foundation. @GaiaFoundation @WeFeedtheWorld_ We Feed the World is a photographic exhibition celebrating the smallholder farmers and fisherfolk who feed the world.